Our residents and businesses are encouraged to recycle items including plastic containers; cartons; aluminum, steel and bi-metal cans; glass containers; mixed papers and cardboard. Find more details here. 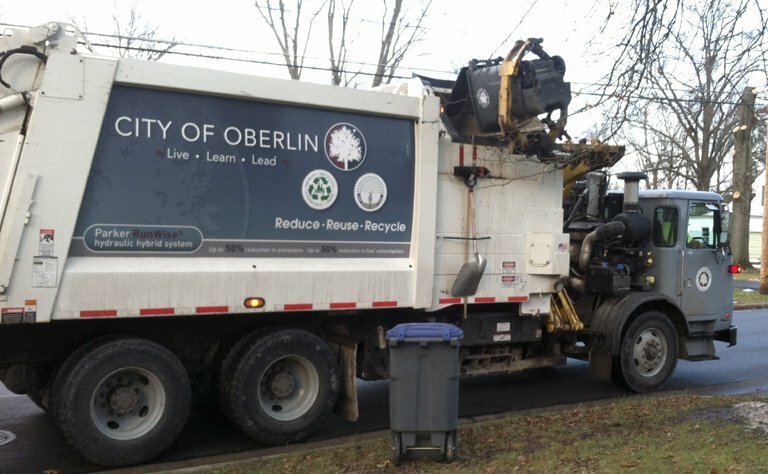 Oberlin offers both residential and business refuse pickup. These services are provided via curbside cart collection, bulk pickup services and dumpster rental. Program, scheduling and contact details here. During the growing season we collect yard waste. This material can be placed curbside in bags that are clearly marked with yard waste tags which can be purchase from the City. Click here to see various collections and dates. Find out more about local and regional collection sites, events, dates and times. Details about special events and collections taking place near you. Here we've provided links to useful sites, articles & tips about recycling, upcycling, etc. Read articles from Earth911, TipHero and other trusted sources. Should you have questions or concerns you can contact the Recycling Coordinator here. Call 935-0096 for refuse & recycling questions or 775-7218 for scheduling.